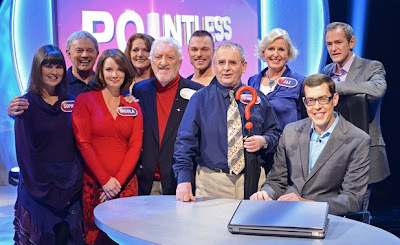 The Doctor Who special of Pointless Celebrities has been confirmed for Saturday March 23 at 6pm on BBC One, just one week before the Doctor returns in the new run of episodes. The one-off edition will see four pairs of Doctor Who stars face off against each other as they try to win the Pointless Trophy. Bernard Cribbins and Jacqueline King are the 'noble team', Andrew Hayden-Smith (replacing Colin Baker who was taking part in I'm A Celebrity Get Me Out Of Here at the time of filming) and Nicola Bryant form the 'sixth Doctor' team with Sylvester McCoy and Sophie Aldred making up the team of the 'seventh Doctor'. Finally, the 'companion' team consists of Frazer Hines and Louise Jameson whilst K-9 (John Leeson and Mat Irvine) will be on hand to assist hosts Alexander Armstrong and Richard Osman. "Doctor Who's got everything hasn't it? It's got amazing stories. It's got a sort of soap opera behind the scenes of who's going to be the next Doctor. It's got great writers and an intelligence and a humanity behind it. Doctor Who has brought nothing but good things into the world." Doctor Who returns to BBC One on 30 March.